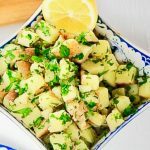 A refreshing lemon garlic potato dish that tastes equally well hot or cold. Serve this as a side dish at your next cook out. Place your sliced new potatoes in a large pot and cover with cold water. Make sure he water goes 1 inch above the potatoes. Season the water with a few pinches of salt. Bring to a boil and reduce the heat to a simmer. Simmer the potatoes until fork tender about 15 minutes. Drain. Let them sit in the colander 4 minutes while you make your dressing. Whisk together the olive oil, lemon juice, garlic and mustard until emulsified. Pour into a large bowl and add your chopped parsley, red onions and capers. Toss in the potatoes and mixx well. Add salt and pepper to taste. Serve hot or cold.